Yesterday, Saturday 28 March, we held a public meeting to update our supporters on the progress made by the campaign and the current position. Some 40 people attended the meeting in the community room at Chorlton Library. Carolyn Kagan, secretary of the Friends of Hough End Hall gives the latest news. Here is a summary of what we said. The Friends of Hough End Hall had to withdraw from the bidding process after being unsuccessful in the bid to the Heritage Lottery Fund. RBS, the Hall’s owner, then set a deadline for bids from other interested parties to be submitted. Not long before the deadline we were contacted by an agent for a charitable foundation endowed by a prominent and well respected entrepreneur who wanted to submit a bid for the Hall, incorporating the community interests and working with the Friends of Hough End Hall. We were obviously delighted with this and after some discussions and meetings agreed to be a part of this bid, which was duly submitted. Full details of how any partnership arrangements would work are still to be worked out but we can assure you we are approaching this with careful risk analyses – particularly as far as any financial commitments might be concerned! RBS received and reviewed all the bids and decided in January to work with three bidders (of which ‘our’ charitable foundation was one) as they refined their bids, clarifying any conditions they had put alongside their offers. The last we heard (just before our public meeting on March 28th) was that RBS was commissioning a full condition survey with any associated specialist surveys needed (such as timber surveys) to give to the prospective bidders, to help speed up the process. For us, this is a little frustrating as we had reached this point last August, by which time we had already got a condition survey completed and had professional costings of the repairs and restoration needed for the Hall. Had RBS agreed to work with us without the messiness of other bidders, we could have been a lot further forward by now! So… we still do not know what role we will have in the event of the Hall eventually being sold. We hope the charitable foundation will be successful and that we will be able to form a constrictive partnership for the future and ensure the Hall is made available for local people. There was a lot of interest at the meeting with people (including local politicians) keen that the Hall really does become an asset for all the community while preserving its heritage value. The meeting also heard from Andrew Simpson and Peter Topping about the book they plan to publish in May. It will be a history of the Hall, focussing not just on the wealthy people who built and owned the Hall, but also on the many people who have been part of its local community. 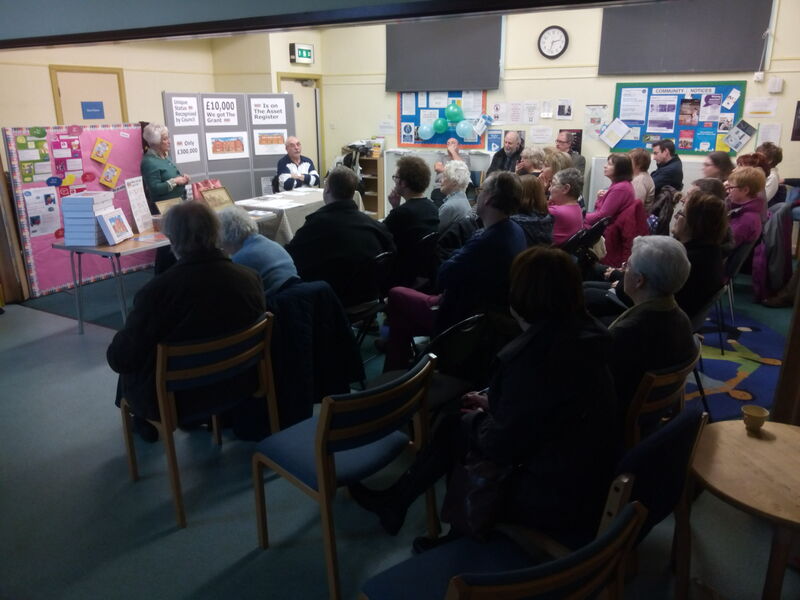 Thanks to everyone who turned out, giving us such a great show of community support for the efforts of the Friends of Hough End Hall. Whatever happens with the sale of the Hall we will continue to work towards its preservation as a heritage and community asset. This entry was posted in Events, News and tagged Andrew Simpson, Carolyn Kagan, Chorlton, Community involvement, Friends of Hough End Hall, heritage activities, history, nomination as community asset, Peter Topping, Purchase of the Hall, RBS, Sale of the Hall by houghendhall. Bookmark the permalink. Fingers and toes crossed that we get the hall for the community. And thank you for your continued hard work.